Fully aware that this novel got nothing to do with espionage or thrillers, I would like to share with the visitors of simplyreaders how much I enjoyed it. 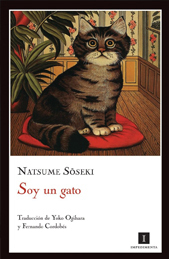 A nameless cat who can only be identified either by the ones of its kind as well as human beings as the teacher's cat, narrates its unusual entrance to the world and to the life of its master, Kushami and with this, the feline will give us its particular point of view in regards to the Japanese middle class in the early years of the twentieth century. Along with its chosen fitness and walks to the house of the Kaneda's, which happen to be the rich people in the neighborhood; the other cats in the area, the friends of his master and the annoying students of the school next to the house; this cat with no name reports every detail of these strange specimens called 'human beings' which, from its point of view, live their lives in the absurd of such occupations and activities obsessed to fit in a new society hungry of Westernization. Are we condemned to bury our needs for art and beauty? Is the concept of 'marriage' valid for the current social groups or would it be better to carry on with our lives as singles for the sake of individualist existences and prevent getting in conflicts with others? Written over a hundred years ago, Soseki´s novel presents valid reflections for any point in time bringing to the table the never-ending debate of the progress with its benefits and its consequences.